The premise and the scares are pretty good, but when it comes to humor and dialogue, this one is pretty dopey. There are things to like about this movie, but overall, it’s not very good. This is the story of a bunch of college aged kids who go out to a cabin in the middle of nowhere and contract a virus. They start getting sick one by one. 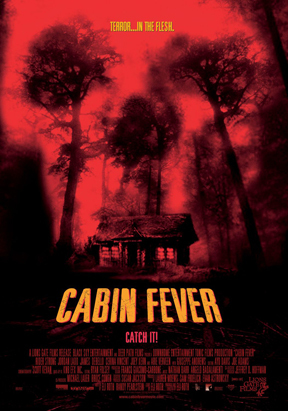 There have been plenty of cabin horror movies, to the point where it’s a sort of sub genres. From the Evil Dead 2 to Cabin in the Woods to Tucker and Dale Vs Evil, it’s a fun sandbox to play in. But this movie is all business and no fun. We don’t get to know the characters, and almost as soon as they get out there, awful things start happening to them. A little development would have gone a long way. The scares are good, but the characters and disalogue are both pretty lousy. And the plot leaves a lot to be desired. Cabin Fever is not a very good movie. The characters and dialogue are weak and the premise is kind of thin. With all that being said, for what this movie is going for, it does work. This movie wants to be a throwback film to a classic kids in a cabin in the middle of nowhere story. Part Deliverance and part Evil Dead, this one isn’t trying to be super witty or intellligent (if want a Cabin horror movie that does that, just check out Cabin in the Woods.) This one is simply trying to deliver on scares, gross outs, and a plot that checks off all the usual boxes as staples of the genre. With that in mind, it starts with this group of kids driving out of town in a pickup truck, and stopping at a rundown convenience store. There’s a strange kid sitting on a swing who bites them. The strange kid on the swing outside of the convenience store is right out of Deliverance. It is definitely a staple of the genre and is meant to tell the audience that our characters are venturing into a place where even the regular, everyday people are a little nutty. But here’s the problem. We haven’t really met the characters yet. We aren’t familiar in the slightest bit with our protagonists. A movie needs to give the viewer a frame of reference before it starts dropping strange characters into the mix. Either that, or the strange characters have to actually be the protagonists, like in Bottle Rocket, which opened with Dignon climbing out a mental hospital window. But here, in Cabin Fever, we haven’t had any time to meet the characters and we’re already at the convenient store. Things are definitely moving too fast. Luckily it all slows down a bit when the kids get to the cabin. There’s a fun scene with Paul (Rider Strong,) and Karen, (Jordan Ladd,) the most likeable couple, out on a raft, in the middle of a lake. The two of them have been friends for ages, and now share their first kiss. There are definitely sparks, and there’s also some humor here too. This is one of the best moments in the movie, because it’s real and doesn’t involve the story trying to force itself into cliches. The characters have a camp fire and tell stories. A guy comes along with a dog named Dr. Mambo, and a whole bag of pot (this is the movies director Eli Roth, who would go on to much bigger and better things.) The kids have a fun night, until a guy shows up with a bloody face, trying to force himself inside their cabin as he tries to get help. The kids are scared. They want this guy to get away and leave them alone, and so they shoot a beebee gun at him. This is where the kids crossover into not being such great people. Granted, they don’t know who this guy is, (he could be a homeless Woods dweller for all they know,) and they are terrified, but this is their judgement moment. Whatever happens to them afterwards, it’s because of this, both literally and metaphorically. What happens is they start getting sick. Karen first. Paul climbs into bed with her and reaches down under the covers and comes up with a handful of blood. He pulls the covers off to reveal that her leg is bloody and deteriorating. She’s got something all over her, and she gets b gins to get sicker by the moment. The guys lock her in her bedroom, and when she continues to get worse, they lock her in a barn. They carry a mattress and blanket out to her, but that’s about it. Things get worse. One of the friends, the annoying fat guy who thinks he’s funny, (James Debello,) goes to town looking for help. He finds himself getting bitten by that kid from the swing and then being followed home by a whole bunch of hillbillies looking to kill him and his friends. The reason is because they believe these kids contracted a virus and are now speeding it to everyone they come across. There’s also a funny character called Winston. He’s the deputy in this part of town, and he’s always looking to party. All he talks about is finding the next party, and he calls Paul the party man. Winston is the guy who shows up the morning after the kids come across the sick guy and he spits blood all over their car. He’s also the he guy they run into again at the end, at an outdoor party of course, after Paul and his friends have been through a lot. Now they’re falling apart too, and suddenly Winston doesn’t like them so much anymore. Especially after Paul shows up covered in blood and ruins the party. The problem with Cabin Fever is that not enough happens. The kids never plays games or do anything fun. It’s lije this movie has an agenda. Bring these kids out to the woods and let the virus attack. That’s why the one scene where they actually are having fun, (the dicks scene,) is probably the best scene in the movie. What does work about the film is that it’s unconventional and unpredictable. There are no clear good guys or bad guys. The threat is not some kind of demon or killer out in the woods, but a disease. And the heroes aren’t exactly likable protagonists. This movie has no problem sacrificing any of them it chooses, at any given time. The atmosphere of these backwards woods and the people who live there, is also pretty great. Unfortunately, there are a few too many problems. The dialogue is bad, the characters are annoying, and the premise might be grounded in something cool, but it ends up being pretty thin.